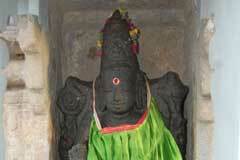 Thirunavukarasar. 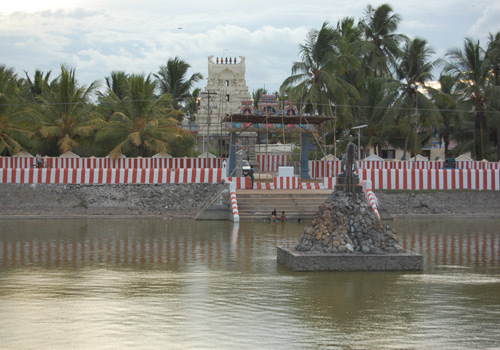 It is one of the 63 rd place of Cauvery thenkarai. 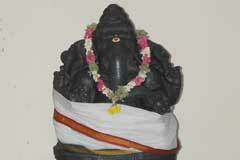 Lord siva is Swambumoorthy here. Mother Sarvanga Sundari, as the names suggests looks superlatively beautiful with four hands. The idol is 5.5 feet tall. 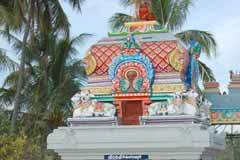 Near to this temple Thirunallam, Vanniyur, Thiruveelimalai are placed. 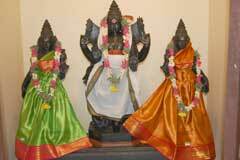 Devotees worship Lord to Removes Obstacles in marriage, Child boon, Excellance in education. Devotees Offer Abishek and vastras for Lord and Ambal. The lesson is that having been born to a wicked person in the past birth, even the divine Mother had to be born again to get back Her Lord so that she would not have to be born again. Those worshipping in this temple will have the eternal happiness of total salvation. 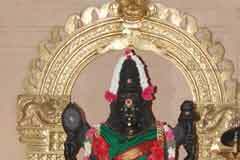 Hence the place came to be known as Karu Illai meaning that there would be no entering into a womb again. In course of time, it got changed as Karuveli which is also an apt name meaning that the place was a fence not allowing a further birth. The place is believed to help one to retain all his/her noble traits for ever and also reform him/her completely from previous wicket qualities. The Lord therefore is praised as Sarguna Nather. Sargunam-noble traits. 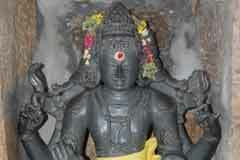 King Daksha, son-in-law of Lord Shiva conducted a Yagna without inviting the Lord. The celebration went on in the absence of Lord Shiva. 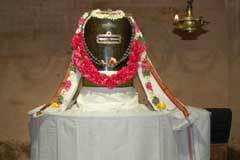 However, Dakshayani, daughter of Daksha and consort of Lord Shiva visited the Yagna though prevented by Lord. Daksha humiliated Her. Unable to bear the insult, Mother Dakshayani fell on the Yagna fire and ended Herself. Lord Shiva flew into passion, came to the Yagna spot, carried the body of Dakshayani and began to dance. His furious dance shook all the worlds. People in all the worlds trembled. 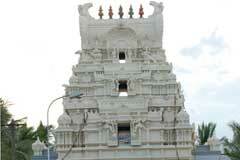 All went to Sri Narayana – Vishnu – and begged Him to quench the fury of Lord Shiva. Lord Narayana applied His discus, cut Dakshayani’s body to pieces which fell in 51 places and they became Maha Shakti Peetas. Lord Vishnu consoled Lord Shiva and said that she would be born as the daughter of Parvatha Raja on earth and that He would perform their wedding in Mount Kailash. Shiva-Parvathi marriage took place accordingly then. Miracle Based: Lord Sivan is swambymoorthy here. 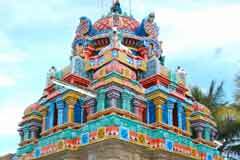 The temple is on the Kumbakonam (22 kms) Mayiladuthurai route via Nachiarkoil. The traveler should get down at the Koonthalur Pudupalam bus stop and walk half a kilometer northward to reach the temple.